This thread was started as a spin-off from a discussion in > An amazing Eve Phone. It was felt that it would be better to give this discussion its own thread. Disclaimer: What I will post here is the culmination of over a decade and a half of my work and experience. Please be kind. Ok, with that out of the way, there are few things that must first be considered for the design direction, even at the conceptual level. 1: A mobile wearable should not be a watch. 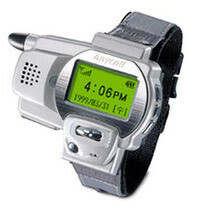 I have seen so many smart-watches over the past few years and before them, so many watch phones going as far back as Samsung’s SPH-WP10 in 1999. I have owned a few watch phones over those years as well and I can tell you both from professional and personal experience that a wearable that tries to be your watch will ultimately fail in the mass market. There are so many issues with this approach, from the obvious style factor, to the impracticability of the tiny unusable screen that will no doubt grace its face. Q: What happens when someone who wants to wear their favourite Chopard, Breguet or IWC buys a smartwatch-styled phone? A: They will leave the smartwatch behind in favour of a traditional phone on the occasion that wearing two watches just would not work. Remember, the wrist was not where that class of timepiece started. It started in the pocket and fashion and practicality dictated its final resting place on your forearm. So if we take a cue from history, we will see that copying the wrist watch isn’t the way forward for wearables. 2: The wearable should not be the accessory of a larger device but should be the core of an ecosystem. Your usage scenarios should dictate what kind of UX and UI you have at the time. Therefore, the wearable should be small, kept out of the way and worn for the convenience of transportation. The ideal interaction with it should be done with a series of wireless dumb accessories designed to take your input and give output in a form-factor that matches the application. 3: Do not put a screen on it. Aside from the obvious style issue (ala point #1), there is the fact that in order to be usable, your screen will dictate the size of the wearable and to a certain extent, its battery life. Use an alternative method of display technology for the scenarios where you will be interacting with it directly, sans wireless accessories. 4: It must be water-resistant. A practical wearable should be something you put on your body and not think about as you go about your day. Having to worry about your wearable when it rains, when you sweat or if you go to the pool is counter-intuitive and unnecessary with today’s technologies. 5: Battery life is everything and contactless wireless charging is a must. Being able to charge your wearable without having to take it off will change the way people use it for the better. Contactless wireless charging that can put a few metres between you and the charger is the ideal solution and it exists today. 6: Processing power, storage and RAM are your make or break specs. If you are going to build a wearable that is worth buying, it should be able to replace more than someone’s aging iPad. Today we can make a dual 64-bit processor wearable with 16GB RAM and 512GB SSD, that runs Windows 10 and has the power to rival your Core i5. It won’t be in the price range of your entry level Apple Watch or Asus ZenWatch but then, why should it be? 7: Understanding your target price point is important. You wouldn’t expect to buy a new Core i5 powered ultra thin tablet for the price of a cheap smartwatch. So then don’t try to build a cutting edge wearable that can replace your tablet/laptop at the price point of the Apple Watch. A wearable that is properly made will be more attractive than a traditional smartphone. This also means it’s more likely to be stolen. If your files are not well protected, then this will be yet another potential threat to your privacy and identity. If the wearable uses biometric security to encrypt its filesystem and has as few physical interfaces as possible, then while it may be a pretty target for thieves, it will be nothing more than a pretty paperweight without its owner. 9: Design from the perspective of jewellery first, technology second. While many of us engineers tend to overlook the aesthetics of our creations as a vital point to be examined at the start of development, we should always remember that what something looks like can already be more than 50% of the battle won when you are trying to get the final product sold. Taking the above points into consideration, the wearable should look like a piece of jewellery. It should be elegant, yet subtle. It must be something that a 15 year old will want to wear and at the same time, something that her 60 year old grandfather would wear as well. You must make it a piece of fine jewellery that takes design cues from the established fashion houses. Do not make a piece of technology then slap a fashion brand on it after the fact, like some famous product designers have done. 10: Support multiple Operating Systems. A worthwhile wearable must not be limited to just one OS like most traditional smartphones. As with a laptop/tablet PC, this is a portable computer that will be used by a diverse range of end users. Much like the Eve V, it must be able to support all of the major Operating Systems that may be used by its target market. As this is jewellery and not a traditional smart device design, there are a few new rules for engineering and materials budgeting. I: Determine the highest materials cost of the largest size in whatever material the chassis will be made of. II: Determine the minimum available space for components in the smallest size in whatever material the chassis will be made of. The following product design is powered by the much anticipated Qualcomm MSM8998 which you may know as the Snapdragon 835 10nm SoC, and shares design characteristics of the Neptune Suite and the Ritot Bracelet. The 10nm process produces a SoC with better thermal properties, making a wearable with this chip a much cooler running and practical device, while simultaneously offering PC-class performance. It is rumoured that the upcoming OnePlus 4 smartphone will be powered by a single Qualcomm MSM8998 SoC bundled with 8GB RAM. Given the lower power consumption that should be expected of the MSM8998’s combination of LPDDR4X RAM and the 10nm manufacturing process, along with its thermal savings, these choices set the bar for the next generation of performance smartphones. Today, high-quality, lowlight camera performance is a must and so this core product and its accessories should have main cameras of at least 23MP resolutions (with the exception of the bundled 4-inch accessory) with aperture sizes of at least f/1.6, laser autofocus or dual lens designs optimized for for low-light shooting. It should also integrate a 32MP main camera into the core device which will have another positioned on its opposing side (one at the top and one at the bottom of the wearer’s wrist respectively). The second, an 16MP with an aperture size of at least f/1.9 and a wide-angle lens, should be positioned as a front/selfie camera. With all cameras, we should pay careful attention to the choices of lenses and optical array designs. With the concept of the Neptune Suite as a starting point, we should first re-imagine the hub as a screen-less, laser pico projector based bracelet, inspired by the the Ritot. This bracelet should be factory sealed carrying no ports or other openings in its body making it more effectively water resistant and along with all compatible accessories, will use wireless contact-less battery recharging technology licensed from Energeous. Furthermore, by standardizing the wireless link interface it uses, third-parties can create other compatible accessories for this product. As we have established now, the wearable will form the centre of an ecosystem where accessories will be built to more effectively allow interaction under various usage scenarios. With this is mind, here is s short list of first generation accessory ideas to complement the concept. 1: Start with a similar display accessory line up to the Neptune Suite including the HDMI compatible dongle for TVs and monitors, a 5.5-inch ‘smartphone’ dumb-display and 10-inch ‘tablet’ dumb-display w/detachable backlit bluetooth keyboard. The dongle should support 4K resolution and the other accessories should each have IPS daylight readable OLED multi-touch screens with resolutions of at least 3072 x 1728 pixels (3K) as well as cameras with f/1.6 apertures, OIS and EIS. 2: Include a 4-inch ‘smartphone’ dumb-display with rollable flexible OLED technology and 1920x1080 pixel (1080p) multi-touch screen as standard with every bracelet. This device should carry a single 20MP camera with OIS and EIS and when rolled and should be around the size of a thick tube of lipstick. 3: Through partnership with designers of A/R glasses (eg LAFORGE Optical), we will also build a pair of eye-glasses suitable for the Augmented Reality applications of the platform which will integrate stereo 16MP cameras as well as stereo high resolution I/R cameras. This accessory will be available in multiple sizes and styles and should support prescription lenses for reading glasses and sunglasses. 4: There should also be a media dock with built-in speakers, to convert the bracelet into a mobile pico projector which positions the front camera towards the user, allowing it to be used for video calls. Simply put, when the user takes the bracelet off, it can be mated with this new dock, to transform it into a tiny portable all-in-one PC (much like Sony’s Xperia Touch), with built-in projector. This dock should also act as a charging cradle and should use magnets to hold the bracelet in place. 5: The same magnetic docking will be used on the back of the tablet and smartphone display accessories (something like this concept from Nexcrea but with the new bracelet instead of the illustrated handset). The industrial design will need to be refined in order to support varying sizes of bracelet while still keeping the back panels of the devices ‘elegant’ and minimalist. 6: There is no need to re-invent the wheel and so I recommend working with a partner such as Bragi to have them make a Special Edition pair of The Dash earbuds (which already include premium features like fitness tracking, heart rate monitoring, voice commands etc) or their more basic The Headphone earbuds, to be shipped with the bracelet. 7: For the battery charging options, create an on-the-go charging case for the bracelet (with internal magnetic docking) which also charges these earbuds, it could optionally store and charge the bracelet and the included 4-inch accessory while other displays are being used. This protective case should be stylish, compact, water resistant, pleasing to the eye, lightweight, sturdy and should store the USB-C cable it needs for its own recharging. The case should also act as a wireless contact-less charging base for the bracelet and its accessories and will integrate standard PalmSecure contact-less authentication technology (to enable owner authentication even when housing the main unit). Finally this case should also carry a multi-card reader and pass-through ports for the bracelet including Gigabit Etbernet, USB 3.0 and USB-C 3.1. This wearable is meant to support more than one Operating system while being powered by two Qualcomm Snapdragon 835 SoCs. These two basic goals present a number of unique design and UX challenges. As a result I have borrowed a few tricks from other systems and architectures I have encountered over my career. First of all the bracelet should be built around a semi-virtualized system with its direct hardware access managed by an advanced low-level OS (think of it like having an intelligent BIOS on an ARM device). The inspiration for this came from the intelligent firmware in the old military-grade BlackDiamond Switchback tablet PC. In this design, direct control of basic system functions such as power management, hardware I/O control and hardware monitoring and management are removed from the user facing OS (eg Android), which can instead be presented with a rather ‘vanilla’ virtualized hardware interface that only requires the most common, lightweight drivers and standard system calls. I/O interface pass-through (eg. USB) is not compromised in this design and the user facing OS is still able to directly address connected peripherals that are not specifically white-listed for firmware control. Think of the design like an embedded server cluster running the user facing OS in a hypervisor. This will allow for wider OS compatibility and reduces the need for special user-level OS drivers for handling such functions as unusual hardware configurations (eg. multiple native displays etc). This style of system design will also easily support modular multi-cpu architectures, allowing hot add/remove of CPU and memory resources, a very important feature for a tiny wearable system with two Snapdragon 835 SoCs. The dual SoC, high memory design will be power hungry and with heavy usage of the embedded pico projector (even though it won’t need to operate over 10 lumens when being worn), a 6000-9000mAh battery will not seem large enough. The workaround to make this a practical design lies in the power-management features of the intelligent firmware, through the dynamic performance modes made possible with the semi-virtualized design. With the more powerful configuration of dual SoC and larger RAM capacity, the system will have enough power to become a practical laptop replacement. To make full use of this however, it must be able to run a powerful OS in the user space that is better suited for the task of replacing a desktop/laptop PC. Build a bracelet that is meant to last with a return-for-upgrade programme giving customers an opt-in by paying a small fee at purchase time. Every twelve to eighteen months (12-18 mos) after this, users can ship their bracelets back, pay an upgrade fee and have its electronics updated. From a mechanical engineering design standpoint, there are a few challenges in the way of getting this design to support such an initiative. One example of how this could be achieved is to design a modular and future-proof chassis with the logic board, battery and storage kept as separate pluggable blocks. In theory, one should be able to design a service station that simply takes in a bracelet and applies pressure to tiny pins/points on the chassis to slide its serviceable modules out on a tray. From a business standpoint, it creates a repeat business model from each existing customer and a flexible standardized hardware interface upon which development of an ecosystem can be continued. Imagine new device form factors and new fashionable chassis styles built on the original modular design making them all backward and forward compatible. This bracelet and suite will be quite an extraordinary piece of modern engineering and a true work of art. For the consumer however, it will just be another piece of fashion/jewellery and so it’s very important from a business and marketing standpoint, to think of it as jewellery with the capabilities of a smartphone, NOT a smartphone designed to look like jewellery. People will gladly spend much more than $1,000 on a genuine piece of fine jewellery but not so much a smart device that looks like Jewellery. Again, using Ritot’s design as the starting point of reference, in addition to a basic polished aluminium and anodized aluminium versions, create ceramic, precious metal and gemstone versions as well as limited special edition versions of the bracelet endorsed by high-end luxury fashion brands (eg. Bvlgari, Cartier, Van Cleef, Arpels, Edward Mirell). This wearable will need to appeal to both the stereotypical male and the stereotypical female demographics in order to be successful. Apart from multiple sizes for many different sizes of wrists and multiple materials for various price points and market demographics, it must also be available in both ladies’ and gents’ collections. Everything else remains the same internally. External layers can be designed and manufactured by third parties including the above mentioned fashioned houses. These layers would be made to precise specifications so even a limited edition or custom design can be assembled and packaged in the same mass-production facility as any other unit. The inner chassis layer will be a space-frame designed and optimized for strength and structural rigidity while maintaining a low weight. For the concept version of this wearable, I have imagined a few possible designs that have outer chassis layers made of aircraft-grade aluminium, stainless steel, ceramic or precious metals for the ladies’ versions or aircraft-grade aluminium, stainless steel, aircraft-grade titanium, ceramic or precious metals for the gents’ versions. Please note that the following images are just early concept renders so there will be missing elements (such as the clasp mechanism for removing the bracelet for example) as well as elements that in a production unit may not be feasible in the proportions or placement illustrated. Also please be aware that the example images illustrating the Augemented reality glasses are taken directly from LAFORGE Optical’s website and are only meant to relate a visual example of an application. I do not own these eyewear images. This computer design forms a part of my vision of the evolution of the personal computer, something I call Cyber Darwinism. OK this is the part where you stop talking of a possible product and start plain trolling… Either that, or you have absolutely no idea what you’re talking about. High-end Snapdragon processors typically have around 3W TDP, so with this one you can’t expect less than 2W. Phones with SD800-series processors are usually made of metal or other material with good heat conductivity, and they’re huge compared to a bracelet. More surface area = better heat dissipation. A bracelet is worn on a wrist, and wrists emit heat. That makes cooling even more complicated. I will link a picture of the Snapdragon 835 below. As you can see, it’s comparable to a US penny. The coin’s diameter is 19.05mm, so judging from the picture, the processor should be roughly 13x13mm. That means your bracelet will need to be at least 2cm wide, and probably much wider because the CPU is not the only thing you need to fit in there. If it’s made of metal, it will be very heavy and uncomfortable to wear, as it’s not flexible. And heavy. Have you thought about how it gets on/off your wrist? from who is maru os ? @TheDestiny: Maru OS was started by a very talented engineer named Preetam D’Souza and became an open source project about a year ago. @pauliunas: Have you read my topic in its entirety before you posting these comments? 1: The question of dual SoC power consumption and the thermal challenges is addressed very explicitly in “Part 4 - The hardware/software interface design”. 3. I am fully aware of the die size and thermal properties of the MSM8998 (Snapdragon 835) as I have already had the pleasure of working with another engineer who has been designing the mainboard for a smartphone that is based around the SD 835. I have already seen a sample unit of this new 10nm SoC and have seen some of the laboratory tests for its performance including the thermals. Without breaching my NDA, what I can say is that it is very much suitable for what I have described above and may actually be the only high-end arm processor presently available (in sample or production quantities) that can work for this specific application. Please note that the following images are just early concept renders so there will be missing elements (such as the clasp mechanism for removing the bracelet for example) as well as elements that in a production unit may not be feasible in the proportions or placement illustrated. Also please be aware that the example images illustrating the augmented reality glasses are taken directly from LAFORGE Optical’s website and are only meant to relate a visual example of an application. I do not own these eyewear images. 5. One of the oldest design tricks in making a device with passive cooling dissipate its heat exactly how and where you want it to, lies in understanding the differences between the thermal affinities of various metals. By layering metals with higher affinities for heat over one another where the metal having the lowest affinity sits closest to the heat source and the one with the highest sits closest to the target area of dissipation, you can incorporate a passive thermal spreader or solid state heat pipe in your design that serves the purpose of pushing this heat where you want it to go. Given the known thermal properties of the 10nm SD 835 and the design I described above, it would be possible to use a chemical and physical make-up for the inner chassis that pushes and spreads the heat of the SoC to the flat open surface of the bracelet that sits away from the wearer’s wrist. To answer your question about whether I do know what I am talking about, yes very much so and with first-hand knowledge of the topic. That is probably the longest post on the forum so far. And I like it. I definitely appreciate the effort you put into this, and knowing that it’ll take some effort to pull something like this off (plus it might take some time - not talking years - until everything in regards of components is fully available to the market) I still appreciate the details you go in. It definitely brought me some insights already. @pauliunas What if not dreams bring the world / humanity to the next level? Do you think inventors for e.g. the car, the light bulb, the telephone, the computer (and here I actually had the pleasure to speak with him multiple times as he lived in my home town), … were dreaming and then waking up telling themselves it was not possible? There are challenges for sure, but so far most (if not all challenges) were overcome by not letting setbacks bring you down. Be optimistic. If the OP is capable of making something like what he suggested possible, then I’d prefer that to happen in a phone first. Oh, and the price estimate… It seems quite low. I’d say arojnd $1500 for the electronics alone. Jewelry goes separately. So the question remains the same: would people pay $1500 for this piece of tech? Or would they rather buy some jewelry without this part, being $1500 cheaper? All that is with the assumption that it’s possible. But it’s not, at least without insane amount of money that Eve doesn’t have. I don’t like it, sorry. I see it as too cumbersome. If any, it should be in many forms more so the user can decide on how to carry it. I would love it if the hologram is included as a visual form of using it. I am under NDA from some of the component manufacturers listed, so I am unable to directly name which of the unannounced components will be available in mass production quantities this year. I would like to clear the air however and just state for the record, that every component listed in this design is either already available or will be available in mass production quantities in time to start development of this project today. This was a very thoroughly researched design and while it may seem like quite pie-in-the-sky for some readers, you can rest assured that it is in fact very much feasible to begin product development for it, right now. The main purpose of this thread is to determine if there is a significant interest from the Eve Community in seeing something like this built. I would suggest leaving it up to Eve Tech’s staff to determine if they can or will do the R&D to make it happen after that. @Ervin: Fair enough. Everyone has their own preferences so I respect your opinion and I’m happy to hear your thoughts and feedback. @exialpho: Let me know your thoughts and feel free to give detailed feedback when you do have that chance. Thanks! Again, hat off to the HATTER for this post. Would personally vote YES for Eve-tech to build it. What about one of these bad boys? Kudos to the OP, even if to my limited understanding the suggested tech seems very ambitious I appreciate the obvious effort that went into that post. That said, it does make me sympathize with the Eve team because my first thought was “hell yeah I’d buy a well-designed smart watch that doesn’t look terrible” right before I hit your first point. Can’t please everyone I suppose. I think I’m probably in the minority given the seemingly dire state of global smartwatch sales, but I really just want something like the original Huawei watch (not the brotastic new version) with better tech. Let me know your thoughts and feel free to give detailed feedback when you do have that chance. This would be a great article, if you were describing a dream, or a vision, but you say it is totally possible at the current state of technology, which it is simply not. All the examples of futuristic tech you list isn’t used in any other real device. This is SolidEnergys current protoype, which as you say reduces current batteries by half. How would you possible be able to put in a 6000-9000 mA Battery in the watch if even an iPhone sized battery wouldn’t fit in a watch. As a comparison, current wearables have 300mA batteries, so yeah, maybe you would get a 600mA battery with the SolidEnergies tech, if they ever manage to produce it in masses. I mean, just read your spec list - you would even have trouble fitting that in a current smartphone, and now you want to tell me it is going to fit in a ROUND bracelet. You would need a curved version of a battery proposal that is not available yet and in prototype stages. And I can’t see you powering 2x Snapdragon 835 with an 600mA battery. I really wanted to like your concept, and be openminded about the “culmination of over a decade and a half of your work and experience”, but when the spec-sheet said 16MP and 32MP cameras I just couldn’t take it seriously any more. Who would even need that? And then you said how you want to add a 4" device with an HD OLED screen that is rollable into something of a lipsticks size? While LG and Samsung most certainly are working on something like this, there is nothing even remotely similar like this on the Market (or even as a prototype). I believe EVE has a great team, but how could they pull something like this off if even the biggest players are far away from something like this? PS: Really, cyper darwinism ? @larseisberg: You have made some valid points and I’ll address your concerns below. 1. The SolidEnergy Systems prototype image you have shown is available on their website and is in fact a Generation 1 battery from about 1 year ago, announced in August 2016. A generation 2 battery would be more than sufficient to provide the density required for this design, far less Generation 3 which may actually be available by production time if development started now. You are correct in stating that current wearables carry a 300mAh battery on average. You failed to mention that the battery is stuffed into a chassis smaller than the volume of the Generation 1 battery shown above and accompanied by all of the other components that make up the smartwatch. Additionally, these smarwatches carry older and often the cheapest available battery technology in order to maintain a retail price-point of under $500. You should consider when making this point that the entire logic board, charger connector, display unit and in many cases heart-rate sensor module also occupies the space inside the chassis of that smartwatch. The proposed design won’t need to have a provision on the logic board for charging connector pin contacts, won’t carry an onboard display nor will it have to pack the battery and Palrsecure sensor into the same plane as the logic board. It should then be clear to see how it would be possible to fit the components mentioned into this bracelet. In terms of fitting a 6000-9000mAh battery into current smartphones, have a look at this video to see what a traditional (ie not a SolidEnergy Systems Gen 2/3) 10,000mAh battery package looks like in a phone that retails for $200. 2. The bracelet is meant to be built around a space-frame with about 60% of its internal volume available for battery. It is not meant to have any user-serviceable parts and as a result the battery won’t be removable. This means there is no need for the same packaging you would use on a user replaceable battery pack. Additionally, batteries for your electronic devices are made of cells and the individual cell size for the type of SolidEnergy Systems battery that would be used for this unit, would allow them to be packed in a shape that conforms to the curved space inside the bracelet. There would be absolutely no need to order some specially designed, experimental, curved battery. 3. The Snapdragon 835 has built in support for a 32MP sensor and there are plenty of smartphone sensors available today that can do 32MP (even in low light), so this is not at all “future technology”. You must remember that by the time you can buy a smartphone, the technology that made it possible was already available to its manufacturers for at least 18 months. Let’s consider for a moment that the amount of power in the smartphone in your pocket is several orders of magnitude greater than the power of the mission computers, on board the Apollo spacecraft (or onboard any of the space shuttles for that matter). Yet most people use the massive amount of processing power that they carry around daily, to snap selfies and to watch cat videos, so… I have learned over the years that when it comes to bleeding edge specs in consumer electronics, not to bother asking ‘who would need that?’. The camera sensor specs were simply chosen to match what is expected in high-end smartphones in late 2017/early 2018. 4. We’ll have to agree to disagree on this point. I am not legally at liberty to speak either a name or even remotely describe a product but I can say that right now there are over a dozen prototype designs which share some characteristics with what is described here, sitting in a cabinet in an office somewhere on the island of Taiwan, three of which have had my fingerprints on them. I am also informed by the person who occupies that office, that for at least one of the three, there are assembly lines somewhere in China’s Guangdong province preparing to churn out the components for mass production in 2017. Yeah, but that is totally my point. The chassis of a current smartwatch is SMALLER than the Generation 1 battery, and it has to stay that small to still be attractive as a watch. And it is just as true that the battery is accompanied by other technology. The talk about Generation 3 prototypes that could make this work seems very uncertain to me. And still, having a 9000 mA battery at the size of a 4500 mA battery would still not make it fit inside the wearable, if you want the the wearable to be actually wearable and as sleek as jn your pictures. The Snapdragon 835 has built in support for a 32MP sensor and there are plenty of smartphone sensors available today that can do 32MP (even in low light), so this is not at all “future technology”. You must remember that by the time you can buy a smartphone, the technology that made it possible was already available to its manufacturers for at least 18 months. Again, who needs a 32MP camera on their wrist. I think this is a totally legitimate question. I didn’t say that it wasn’t possible, I just think that wanting too cram so much megapixels together on such a small sensor is an incredibly bad decision. I don’ think that is very true. The megapixels of smartphone cameras have been going down, not up, for obvious reasons. Remember when everybody said 21MP was the future? There is a reason why the iPhone, Google Pixel etc. only have 12MP, and are still rated as the ones with the best camera. d) can easily take on the 10+products you have mentioned as accessories or as part of the ecosystem, that in itself already require massive innovation. e) would want to make such a risky business decision. the EVE V is a relatively save product for them to make, and even at that has its challenges. Yeah, but that is totally my point. The chassis of a current smartwatch is SMALLER than the Generation 1 battery, and it has to stay that small to still be attractive as a watch. And it is just as true that the battery is accompanied by other technology. The talk about Generation 3 prototypes that could make this work seems very uncertain to me. If a 300mAh battery and all the rest of the components can fit into that tiny space on a smartwatch where the battery does not occupy the vast majority of the (already limited) volume, then imagine what can be done with a space that is several times larger. As a bonus, this space doesn’t need to carry some of those components (eg, display) that the smartwatch must accommodate so that gives more to work with. All the while, this is being achieved in a product that has a much greater chance, by the end of it of looking like the piece of fine jewellery in the renders. Boasting is a construct of the ad-copy approved by the head of a marketing department after several other marketing directions and themes have been discarded. It has nothing to do with the original product, it has nothing to do with being ahead of the curve and it certainly has nothing to do with not compromising on making the best possible product. The only things of interest for these companies by that stage is the volume of units (in the millions) they will move in a year, the mark-up per unit and the rate of growth YoY for this product category. Apple is an innovator when it comes to marketing consumer electronics more than anything else. They have perfected the art of selling 3 year old technology in a pretty package over and over again to an unsuspecting public, with minor incremental tweaks offered once a year to feed this new disposable culture. You really should read up on the dark and sordid history of the iphone’s development (and not from a pretty hard-cover picture book published by Apple themselves), from the NeoNode Patent bullying, Synaptics & Pilotfish days all the way to dead Foxconn employees, conflict metals and environmental and consumer health threats. It’s all business and in the most immoral and irresponsible ways possible outside of the oil industry. It’s quite sadly, also common practice among the most “reputable” giants. On the other side of the coin, due to their lack of massive operating overheads and a need to ship such large quantities to remain afloat, It’s the little startups that are more agile compared with the behemoth. These little companies are the ones that have to prove their worth and they can do so, much more easily if they are led by experienced founders and have the financial backing to spread their wings. This is incidentally, one of the reasons why I back start-ups and why I have tried to work with start-ups, to make this vision a reality, from the beginning. I don’t know what else I need to show you short of building and demonstrating the thing myself. I listed 6000~9000 based on what may or may not be possible between a Gen 2 and Gen 3 SolidEnergy Systems battery. If a Gen 3 is available and can be provided at 9000, then with the only other factors to consider being cost and volume of availability, then we go for it. Barring significant loss of volume when the final clasp mechanism is incorporated into its design, the intended size of the bracelet and the density of the batteries in question will permit at least a 6000mAh on Gen 2 technology, ok? I don’ think that is very true. The megapixels of smartphone cameras have been going down, not up, for obvious reasons. Remember when everybody said 21MP was the future? Let’s agree to disagree on that and I’ll just say first there were several camera phones in 2016 with sensors ranging from 20~23MP and if you recall, 2016’s most popular arm processors for smartphones topped out at around 23MP sensor support. Secondly, it’s still Q1-2017, let’s wait and see, shall we? There is a reason why the iPhone, Google Pixel etc. only have 12MP, and are still rated as the ones with the best camera. As you have rightly said, 32MP isn’t needed and neither is 12MP nor 16MP for that matter, If you have the right sensor and decent optics. However, don’t assume that this has anything to do with the decisions made at Google or Apple to use 12MP cameras in their phones. You could use the same argument that the 4:3 aspect ratio is better for mobile because Apple used that on their ipad and I’ll argue it was cheaper for them to make a deal with a dying manufacturer in Taiwan who could make these panels on the cheap at the time of the ipad’s development or that it was easier from the software point of view and would save Apple time and money… but what exactly would this achieve other than to waste time and energy that neither of us will see again? The truth is that we on the outside of these companies will never know the true reason for the components chosen in their production models and very likely we will also never know what alternate components their prototypes used either. I can speculate it’s business not tech and you and I could argue until the stars fall but does it matter? I didn’t design this because of what Apple and Google are doing, I designed it because of what is needed that no one else is doing. Do I really have to agree? We are all entitled to our opinions so you have yours and I have mine. What I can say is that when I last checked, neither of us worked for Eve Tech and while I won’t speak for you, I personally do not know what their R&D budgets are nor do I know their roadmap nor internal mission. First of all, in the consumer electronics business, nothing is truly “safe”. Developing consumer electronics products is like preparing your new line for a fashion show. You are entirely dependent on the moods and whims of the public as they respond to marketing campaigns. Success in this season is no guarantee of success in the next. Now with that said, if you recall, they started off with a relatively “safe” Atom based tablet. Basically there are many factors that make it easier and a much lower risk to start there, just like in the ARM development world, it’s much easier to start using a Rockchip SoC or a Mediatek SoC than anything that comes with Qualcomm’s terms and conditions. Eve Tech have since dove into a much bigger challenge and from what we can see so far, it looks like they have come out very well on the other side, producing something that can compete well with the industry leaders and in many areas actually beats several flagship products. I would say that if you follow that train, their next project shouldn’t be something that once again puts them a few steps ahead of the leaders and leaves them quite comfortably seated inside the pool of “mainstream”, it should be something that sets the bar to potentially re-shape a stagnant industry. However, again, this is just my opinion and like yours, on the topic of what Eve Tech would or would not want, is quite speculative and irrelevant as neither of us works for the company. We, like 99% of the members of this forum are simply the public who have registered for a free account to post opinions, random chit-chat about what we would wish to buy, what we like and dislike about a set of rather passée product categories within the consumer electronics space today, all in between the calls, meetings and reports that make up our own work days. Don’t get me wrong, I admire your persistence even if your content may be a bit lacking in substance, which is why I “Liked” your last post. However, please do not forget what we all really are in this forum as you may risk a slip down the slippery slope towards becoming a pop-brand fan-boy. It seems you are not interested in serious discussion anymore. How would that “bracelet” you imagine be any larger than a 42mm/ 46mm watch? I would argue it might actually be smaller because that “bracelet” is curved. And yes, that is a problem for a lot of components that are build for current smartphone and smartwatch designs. Yeah, and instead you want to build a pico projector into it! All the while, this is being achieved in a product that has a much greater chance, by the end of it of looking like the piece of fine jewellery in the renders. I think with all the components you want to cram into that thing has a greater chance to look a lot more like electronic handcuffs. I am just going to ask again: Why is there just one little company with zero relevant that has this big batteries in a smartphone if it was that simple and safe to implement? Wow, you are truly reaching here! Yeah, and that applies to your cool battery inventions, to pico projectors, even to your “bracelet” vision. It is also just a product, there to make money - I mean, do you really think your bracelet with a near 2000€ price tag is going to change the world? In a world without pockets maybe. Barring significant loss of volume when the final clasp mechanism is incorporated into its design, the intended size of the bracelet and the density of the batteries in question will permit at least a 6000mAh on Gen 2 technology, ok? Sure, whatever you say. Let me summarise: You say it is going to fit, and so it is going to fit. Wonderful, and so full of substance. Don’t get me wrong, I admire your persistence even if your content may be a bit lacking in substance, which is why I “Liked” your last post. How gracious of you to like my post, even though I really don’t now anything about the subject - ha! Look at what you have written, how pretentious and arrogant you sound. “All my experience” " I had it in my hands" Really great, substantial proof of your expertise. Are you serious? I thought we had a certain level of polite discussion here, but I should have seen this coming, given your pretentious statements above like calling your “Invention” the future and calling it “cyber darwinism”. You know, the last abuse of the word darwinism did not go so well. you may risk a slip down the slippery slope towards becoming a pop-brand fan-boy. Doesn’t that sound lovely? I think this is my new bio text. Thanks for that. At least something valuable has come out of this discussion. So, would anyone else like to have a mature and productive discussion about this concept that doesn’t degenerate into an angry, childish, incoherent (bordering on absurd) rant? It would make more sense for you to make your own company and through a series of more conservative projects be able to achieve this financially in the future. Eve after all started off small and is moving up. Why aren’t you going down this path yourself?